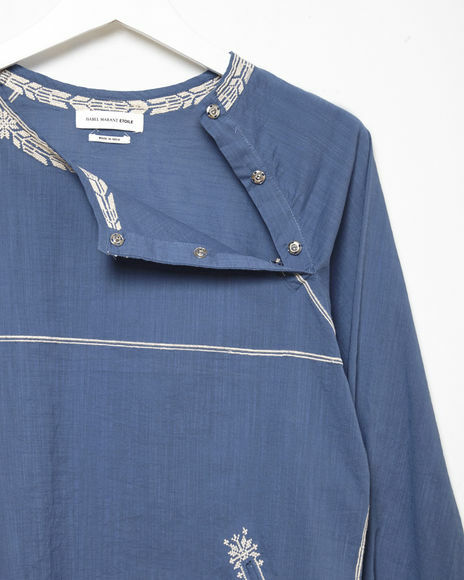 I've had my eye on this embroidered top by Isabel Marant since it first popped up in the new arrivals online a few months ago. It's sale time now, which means it's also time to click through my wish list and choose favorites to add to my wardrobe. This one is a definite yes because it's casual and easy to throw on and style many different ways. The color and the details are what really get me with this one. I typically go for black and grey but if you see me in color, it's most likely a shade of blue. This one is bright and beautiful. The embroidered details make it interesting while still maintaining a minimalist vibe with a hint of the bohemian style that Isabel does so well.